Pakistan has decided to hold party elections for the legislative assembly of the Northern Areas on November 12, 2009. According to official sources, the Chief Election Commissioner of the Northern Areas has ordered the commissioner to start preparing the election lists for all seven districts. The assembly completes its five-year tenure after being elected on October 12, 2004. The government has also decided to take some measures in accordance with the Governance Amendment Order before the elections. According to the new amendments, the Senate will be formed along with a council and the prime minister of Pakistan would be given the post of chairman of the council. The chief executive would be the chief minister. The new amendment order, which has to be approved by the Federal Cabinet, would also include amendments to end the post of governor in the Northern Areas and to change the name to Gilgit Baltistan. 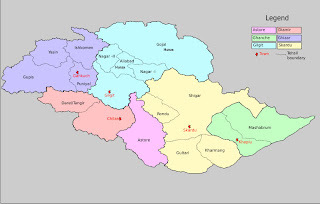 Gilgit Baltistan borderS Swat, Dir, Chitral and Kohistan districts of NWFP. Gilgit Baltistan is a constitutional part of Pakistan, but Pakistan has administrative control of it and officially calls it the Northern Areas of Pakistan.